The Victoria & Albert Museum, now the largest museum of decorative arts and design, has its origins in 1836 and was established here as the South Kensington Museum in 1857, on part of the site of the Great Exhibition of 1851. As its collections grew, museum buildings were added and by 1883 formed a quadrangle surrounding a central courtyard garden. In 1890 a competition for new museum buildings was launched, which created the new main façade on Cromwell Road. The foundation stone was laid in 1899, and it was on this occasion that the museum's name changed to the Victoria and Albert Museum. In 2001 a major renovation programme was launched, which has included re-landscaping of the central court garden, named the John Madejski Garden after its benefactor. Opened in 2005, it has a formal layout, with an elliptical water feature that can be drained so the area can be used for events. Has taken part in Open Garden Squares Weekend 9 times, most recently in 2012. The origins of the V&A Museum date from 1836 when a House of Commons Select Committee reported that more encouragement should be given to the arts and design, as a result of which the government set up a number of design schools and museums of art, which were to contain examples of ancient and modern works of art and design and to be open free of charge. The School of Design in Ornamental Art opened in 1837 in Somerset House, with a collection of plaster casts and ornamental art used to instruct the students. By 1851 more space was needed for the school and its growing collection and Henry Cole (1802-82), a civil servant, was appointed to seek a solution. Cole, who had been centrally involved in the Great Exhibition of 1851, became General Superintendent in 1852. Under Cole the casts and ornamental art works were transferred to Marlborough House, which Prince Albert loaned to the School. In 1857 the collection, which was known as The Museum of Manufactures, transferred to Brompton Park House in South Kensington, which was empty at that time. Built for Queen Anne's gardener, it was located on the south-east corner of the Great Exhibition site, the government having purchased 12 acres of land that was previously part of the Exhibition site for £60,000 out of surplus from the Exhibition. Following its success Prince Albert was particularly keen to promote the application of science and art to industry and this represented the first step to realising his scheme for a ‘village’ of museums and similar institutions at South Kensington, that include the Natural History Museum (q.v.) and the Science Museum. More space was soon needed as the museum collections expanded with numerous loans, gifts and bequests and the museum was initially housed in a temporary structure designed and built c.1856/7 by Charles Young & Co., a utilitarian iron-framed structure with 3 aisles, corrugated iron walls and curved roofs that was nicknamed The Brompton Boilers for its supposed resemblance to a series of steam boilers. The first permanent museum building was built in 1857, designed by Captain Francis Fowke, Royal Engineer, who had been appointed museum architect by Cole. Built of red brick with much terracotta ornamentation, it still remains as part of the much expanded museum complex and is now the Sheepshank Gallery, overlooking the main internal garden courtyard. It was opened by Queen Victoria in 1857 as the South Kensington Museum. An earlier design from architect Gottfried Semper was rejected as too costly. The museum was added to with new courts and galleries, including galleries built in 1858/9 designed by Fowke. His North and South Courts opened in 1862 and ranges on the north and west sides of the garden were built in 1864-9. In 1865, as the South Kensington Museum moved into its larger, permanent premises, the museum’s management proposed splitting the iron building into three parts and offering these for a nominal sum as premises for district museums elsewhere in London. Local philanthropists in Bethnal Green had been lobbying for a trade museum in the area and Bethnal Green became the only respondent to the offer of the iron building. As a result the Brompton Boilers Museum was re-erected as Bethnal Green Museum now the V&A Museum of Childhood (q.v.). Fowke's north façade was designed as the main entrance of the South Kensington Museum, which had a fine pediment celebrating the Great Exhibition by Godfrey Sykes. Brompton Park House was demolished and the south range was built in its place. After the death of Fowke in 1865, Henry Young Darraccott Scott, also an engineer, was appointed museum architect, and he designed what is now the Henry Cole Wing in the north west of the garden, built in 1867-72. The northern part of the site was completed when Scott's Art Library on the south side of the garden was built in 1877-83, which created a quadrangle around a central garden. The educational remit remained an important component and among facilities for students there was a fernery that was visible out of windows of the north arcade designed to enable student art teachers to draw from plants at all seasons. In 1890 a competition for new expanded museum buildings was launched by the government, which would also create a new main façade on Cromwell Road to complement that of the Natural History Museum. Eight architects were invited to submit designs, which were judged by the Prime Minister and four MPS, advised by Albert Waterhouse, the architect of the Natural History Museum. It was won by Sir Aston Webb in 1891 but building did not start until 1899 when funding was in place. 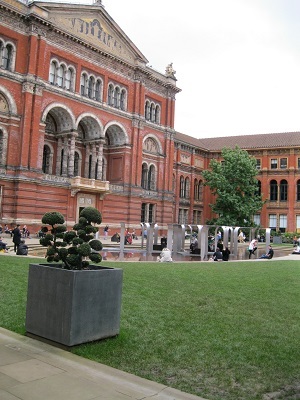 The foundation stone was laid in 1899, the last official public appearance by the Queen, and it was on this occasion that the museum's name changed to the Victoria and Albert Museum. The museum was opened by Edward VII in June 1909, and it is now the largest museum of decorative arts and design. In 2001 a major renovation programme of £150m was launched, which has included re-landscaping of the central court garden, designed by Kim Wilkie and named the John Madejski Garden. The new central garden opened on 5 July 2005 and has a formal layout, with an elliptical water feature that can be drained so the area can be used for events. A central path is flanked by lawns, with herbaceous borders on the north, east and west sides with paths. An American sweetgum tree has been planted in the corners of the north façade. Glass planters are on the south, east and west edges of the lawns with orange and lemon trees in summer, bay trees in winter. Lighting is used to illuminate garden and building façades at night. The garden is named after benefactor John Madejski, now Sir John, who donated £2m to create the garden.